This brownie energy balls recipe tastes just like brownie batter! It’s made with 5 simple ingredients and comes together in 10 minutes. Plus, it’s vegan and gluten free! After my last post, I think it’s time to lighten things up a shade. 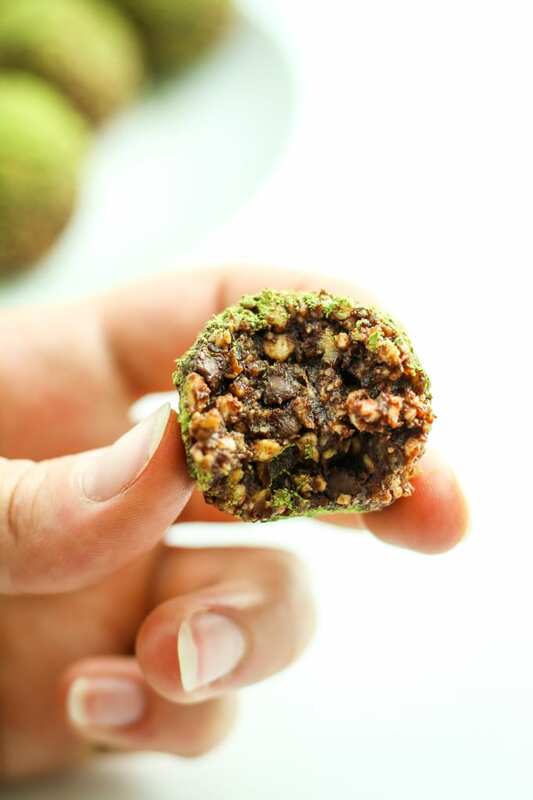 Let’s talk about fun stuff like brownie energy balls that are dusted with matcha. I am not playing around when I tell you that these bites taste like straight up brownie batter. I wouldn’t lie to you. ESPECIALLY when it involves healthy food that tastes like dessert. In other fun news…. DUDES. Mexico is coming. We’re 33 days away from hopping on a nonstop flight (!) from Denver to Puerto Vallarta and I. CAN’T. WAIT. 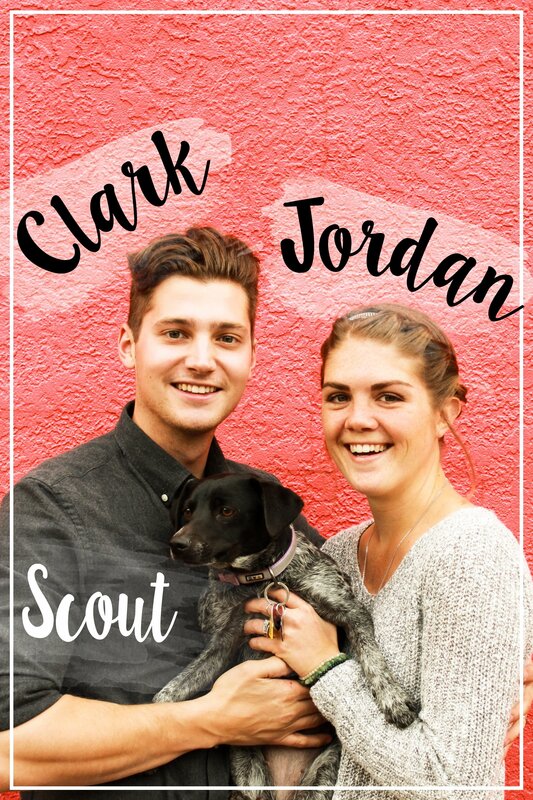 36 days until we’ve been married for 5 years – August 4th. Don’t even ask me how 5 years have gone by since our wedding day. I can’t comprehend. This trip is going to be the first time we’ve gone somewhere to just RELAX since our honeymoon. Needless to say, it’s long overdue. Clark’s new passport just arrived. We got our plane tickets for $150 total – for the both of us – thanks to our Southwest Rewards points. We rented a car for 8 days for $7.20. Our Airbnbs cost less than $500 total – we’re staying in Sayulita for the first half of the trip and Puerto Vallarta for the second half. Everything is blissfully, wonderfully taken care of and now we wait. We’ve been busy making some pretty big changes to The Fitchen over the last couple of weeks so pre-vacation time has been FLYING. New logo, new look, and a new fitness section with workout videos coming soon! Plus we’ve been stockpiling recipes so we have plenty to schedule while we’re on vaca. (Do Millennials actually ever stop working?) We’re so excited to roll out these changes – you gotta tell us what you think! Do you dig the new layout? How about the logo? Do you ever do workouts at home? What kind of recipes do you want to see in August? Alright – enough about Mexico and nerdy web stuff. Let’s talk FOOD. That’s what you’re here for… am I right? Specifically, these amazing little brownie bite balls of goodness. The best part about this recipe, other than the fact that it tastes like brownies, is how EASY it is. We pulse the cashews in the food processor, then we pulse the dates, then everything gets hand-mixed together and formed into balls. And then… WE EAT! Got it? Good. Now go make these ASAP and share your masterpiece with me on Instagram! This brownie energy balls recipe tastes just like brownie batter! It’s made with 5 simple ingredients and comes together in 10 minutes. Vegan, gluten free! 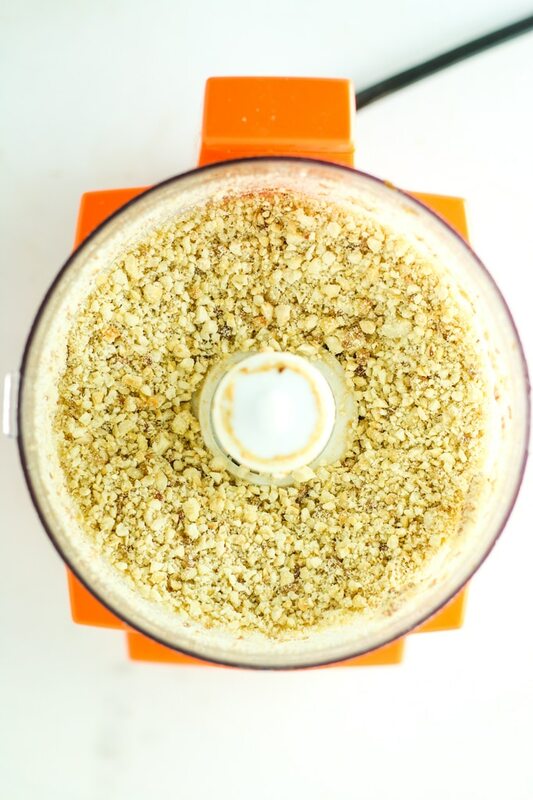 Add cashews to food processor and pulse until they’re broken up into small bits. See below photo. Don’t process too long – we don’t want a flour consistency! Empty cashews into a large bowl and set aside. Add dates to the food processor and blend until they form into a big, sticky ball. This usually takes 20-30 seconds in my processor. Add the date paste to the bowl with cashews, then add chocolate chips, maple syrup, coconut milk, and a pinch of sea salt. Use your hands to mix it all together. Once everything is well-combined, scoop out small handfuls and roll them into balls. I like to make mine about 2 tablespoon-sized. 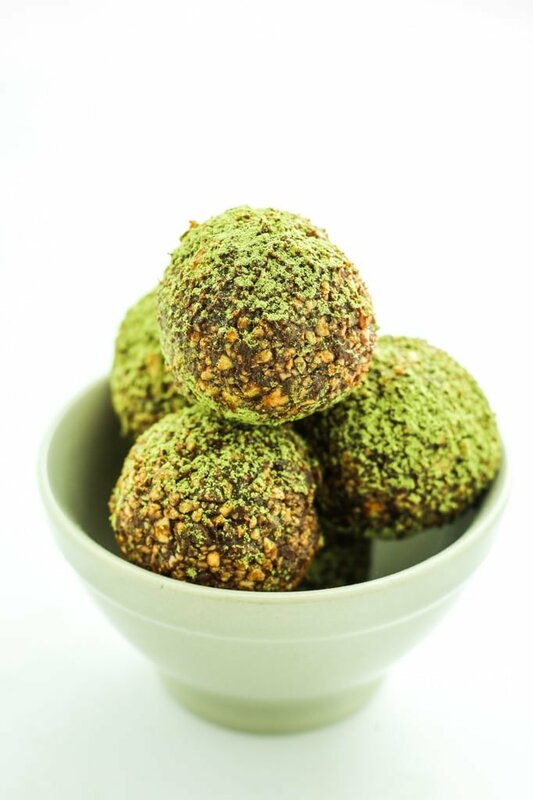 If desired, sprinkle matcha onto finished energy balls. Store in the fridge for up to 2 weeks! Yummy!!! Brownie energy bites – sign me up! What a fantastic recipe thanks for sharing! Who doesn’t love brownies?! 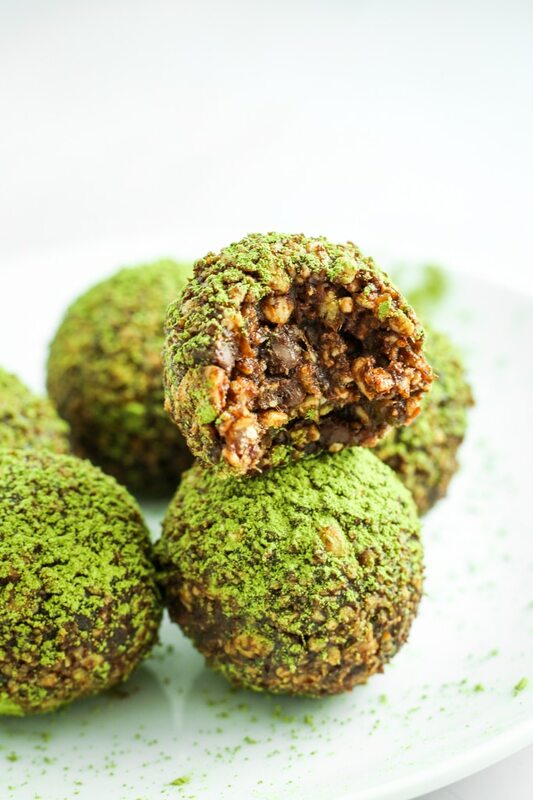 Love matcha and all the ingredients packed in these healthy bites! Shoot – I wouldn’t trust anyone who didn’t like brownies! Lol. Hope you enjoy! These would be great to have as a midday snack! I needed something new to try! You had me at brownie! Haha! These look absolutely amazing! I’m a brownie freak! :) Hope you enjoy! These look like the perfect grab-and-go bites. I am notorious for forgetting to eat, so having this kind of snack on hand is essential. Love the matcha dusting, too! Oh goodness yes! These are the perfect quick snack for a pick-me-up. These look SO good!! And I know we are going on almost 3 years married and I still feel like it was yesterday! You had me at “tastes like brownie batter”! Energy balls are my fav snack! These will be happening soon! Yum! Right!? I’m a lick the bowl kinda girl, so these are my new favorite. I just happen to have all of the ingredients on hand … these may need to happen tomorrow! Energy ball recipes are the best! I’m totally pinning this for later!